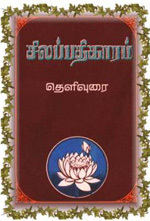 Silappathigaram is an epic in the Tamil language. It is one of the five big Ipermkappiyam of Tamil literature. It narrates the entire history of Tamil nadu during that period. The Author of this literature is Ilango Adigal. He was a brother of a King Cheran Chenguttuvan. It narrates the history of 3 kingdoms Chera kingdom, Chola kingdom and Pandian kingdom. He has narrated the story of a couple Kovalan and his wife Kannagai. Kovalan a rich merchant in Poombughar pattinam married Kannagi, a daughter of a rich merchant. After sometime Kovalan fell in love with a dancing girl Madhavi. And he started living with Madhavi. After some time there was some difference of opinion between them and got separated. Kovalan came back to his wife, she welcomed him without any grumbling . Then Kovalan wanted to start a business .He did not have money to start to business and he wanted to start the business in a different area .Then he has taken one of the leg bangles Silambu of his wife Kannagi for sale to Maduri the capital of Pandia Kingdom. In that kingdom the king Pandian Neducheziyan has lost his wife's leg bangles Silambu .The culprit jewel maker was the real thief. But he has managed to make the King Pandiyan to believe the Silambu of Kovaln the real Sialmbu of king's 'wife. The king Pandian Nedubcheziyan did not conduct any enquiry. Immediately he gave punishment to Kovalan to chop off his head, The punishment was executed immediately. On hearing the news Kannagi came running with a anger to Madurai the court yard of the king. She has proved the Silambu of Kovaln was the Silambu of her. Then only the king Pandiyan Neduchziyan has realised the true and fell down died.The queen Kopreundevi also fell along with the king, her husband and died. We have published this rare literature in cd so this kind of rare literatures can be saved for 100 of years. We hope tamil loving people in the world over will support us to safe guard such rare literatures. This literature is a simple one. Its Author is Ovvaiyar who lived in Tamilnadu in the 2nd to 3rd century. This literature teaches how to live peaceful and holy life.The poems are simple self explanatory. It teaches to lead a good life. We, Tamilians go with the old literatures. With a view to propagate this old literature. Cost of the cd is Rs. 275 in India inclusive of postal charges. 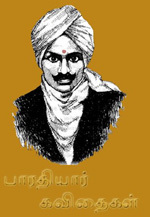 We are publishing the poems of Mahakavi Barthiyar in the Cds. He lived only up to 32 yrs age. Within that period, he has published thousands of poems with rich meaning. His words in the poems are so rich and with forceful to kind to our hearts. Before getting our Independence he has published the poems of as if though we got Independence .He has loved tamil nearer to his heart and made others also love tamil. Tamilians living all over the world will get benefited by studying his works. I am lover of tamil language and I am very fond that the tamilians all over the should not forget our rich language. Cost of the cd is Rs. 275 in India inclusive of postal charges.